Okay, I am going to ‘fess up right away, this table was a very quick thrown together table. I had planned on a completely different table but, time slipped away. We returned from our trip Monday and ended up dealing with 3 different meeting with government offices, an annual dinner (a couple of hours away), preparing for a Christmas show this weekend, a meeting at the Princess’s school and an out patient surgery (Troy). That was my last 4 days! I still don’t even have our truck completely emptied from our trip yet. I am surprisingly happy with the way the table turned out. It looks like Christmas and is fun. 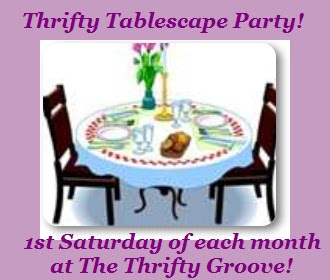 And of course, Thrifty! I am starting with the thrifted poinsettia placemats I shared with you a couple of weeks ago. They were bought at a thrift store for .50 cents each. Before we left for our trip, Troy and I stopped at the Detroit Salvation Army. I picked up several fun things. One of the things I got was this set of Christmas Tree dinner plates. They were marked 2/.99 cents. And they were purple sticker and it was purple sticker day. So, each of the plates ended up being .25 cents. Can’t beat $1.00 for a set of 4 Christmas plates! Another .25 cent plate find was found at Kroger. They clearanced all their Fall dishes and I snagged 3 different sets of salad plate. I am using these mossy green ones. Granted, not a “Christmas green” but, it still works. On top of the green salad plate I placed one of my everyday Johnson Bros white ironstone swirl saucers. They kind of mimic the swirl pattern in the dinner plate. I have had these saucers for years. These pine tree wood napkin rings were just bought at the little shop I told you all about yesterday (TTF party post). It is a set of 6 for $3.00. The clear acrylic flatware was bought at Meijer clearanced for $5.00 this past summer. These are just handy for all kinds of settings. And the napkins were clearanced a couple of years ago from Walmart. They came with 4 placemats as well. Each 8 piece set was marked down to $3.50. I had bought 4 sets, red, green, ivory and gold. I used our everyday glasses (Dollar Tree). The white coffee cups and saucers are also an everyday set. I bought them at a store I did a mystery shop at so, they were free (had to purchase and then be reimbursed). The centerpiece is a super easy centerpiece. Nothing elaborate. The other day I stopped at the Dollar Tree and picked up these two sparkly red and green foil trees. I thought since the dinner plates were a Christmas tree design, Christmas trees for the centerpiece was appropriate. And you can’t have Christmas trees without presents under it! I picked up the foil wrap at the D.T. as well and wrapped ……..
Yup, jello and pudding boxes seem to be the right size! The princess was very excited to watch me set the first Christmas table and asked if we could eat at it. So, this tablescape will be sit down and eat at table. I will just remove the fourth setting and push the simple centerpiece back to make room for food. So, that is my thrifty December tablescape! I can’t wait to see your fun and thrifty ‘scapes as well! Don’t forget, I am hosting a “Send Cheers to our Military Families” giveaway. Click the picture below to check it out. Very pretty Christmas table, Diann! You find some of the best sales...we need to change your name to the Queen of Thrifty! Beautiful holiday Tablescape. Great finds. I'm so-ooo jealous about those napkin rings. I absolututely ADORE them. Take care. Beautiful! Diann, you've done it again. You create such lovely thrifty tablescapes. Wow! That is so beautiful! Oh my gosh.